I am a firm believer that all children need wooden blocks…lots of wooden blocks. As a teacher of preschool and elementary school, I have seen how children who spend hours of open-ended play with wooden blocks benefit greatly. They are better problem solvers, better mathematicians, better artists, etc. I first learned about Tegu magnetic blocks when I wrote a post two years ago on “The 5 Best Wood Building Toys”. Tegu was not included, but the company read my post and commented. It all started with an innocent, curiosity-driven question: “Could we create a for-profit company based in Honduras that would foster a positive social impact through its business?” Chris posed that question during a work trip to Honduras in May 2006 where he reconnected in Tegucigalpa with friends dedicated to an impactful humanitarian project; seeking an answer to the question sparked the idea that became Tegu—a toy business founded to address unemployment, neglected natural and human resources, and the need for entrepreneurship in Honduras. We were recently sent Tegu Natural Pocket Pouch Prism, 6 Pieces. “Click-Clack”. It’s the iconic sound of two Tegu Blocks coming together. 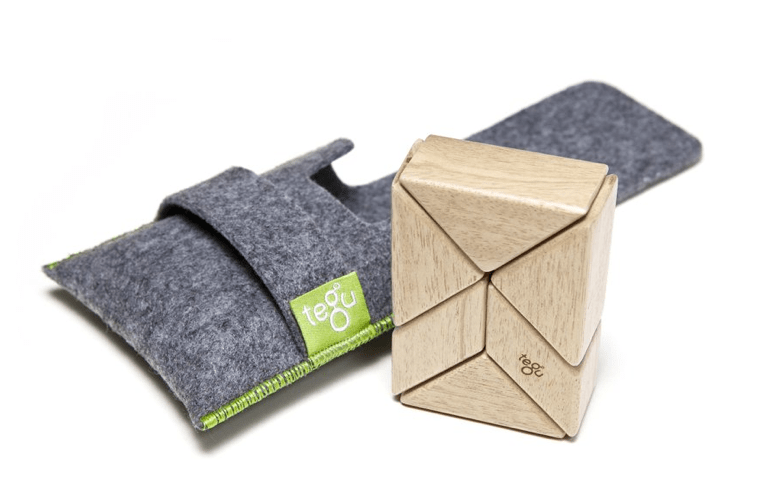 Tegu has reinvented the wooden block in a way that brings new life to a favored classic. By safely embedding magnets into each piece, Tegu Blocks become curiously attractive for both kids and kids at heart. Defy gravity and push your imagination in ways never before possible. No instruction manuals or electronics, just toys that demand imagination and inspire limitless creativity across all ages. Open-ended play is endangered, but we’re bringing it back. Created with beautiful Honduran hardwoods and safe water-based finishes, these blocks have proven wildly addictive for kids (and kids at heart) and will encourage the simple joy of creating for generations. There is something magical about watching a child’s imagination unfold. The curiosity. The ingenuity. The creativity. Even more exciting is creating a product that unlocks a child’s mind. We exist to create experiences that captivate children in safe, natural and innovative ways. At Tegu, this creativity also meets responsibility. Through socially responsible business practices and humanitarian efforts, we are dedicated to helping the Honduran community with reforestation, education and social outreach initiatives. This set includes 6 blocks and is packaged in a beautiful, industrial felt pouch. Ages 0+ Warning: This product contains small magnets. Swallowed magnets can cause complications leading to serious infections and death. Seek immediate medical attention if magnets are swallowed or inhaled. I really like this little pack of Tegu blocks. Even though there are only six pieces, there is an infinite number of possibilities. The little felt pouch is handy, and I think this is a great traveling toy, especially considering they are magnetic making block building possible in the car or on an airplane. These eco-friendly blocks would make a great stocking stuffer too! What’s in your supplements? Petroleum, rocks, artificial dyes?